Ever wonder how the brain processes all the information from your senses? Your brain has to constantly be aware of what you're seeing, hearing, smelling, tasting, and feeling. It has to know what parts of your body are moving and what parts are still. That's a lot of information to keep track of. Today we're going to do an activity which will show you how the brain "sees" your body. This activity is about your sense of touch, but the punchline applies to all your senses and also to muscle movement. I usually do this activity with middle school students, but I the first time I did it when I was in high school. 1 friend or parent. This is a two-person activity. 2 things you can poke with. The tips should be as small as you can get them without them actually being sharp and painful. Sharpened pencils work well, or un-folded paperclips, or compasses from math class. For the rest of the experiment, I'm going to call these "the pokers". 1 pencil, or some other thing you can write with. 1. Have your partner close their eyes. If they peek, the experiment won't work. 2. Take your pokers, one in each hand, and press them into your partner's upper arm at the same time. Have them spaced about four inches apart. You should press just hard enough that your partner feels them, not so hard that it hurts. If your partner is wearing sleeves, have him/her roll them up first. The experiment works best on skin. Ask your partner how many pokes they feel. They should say "two". 3. Move the pokers closer, and ask how many pokes you partner feels. Keep moving them closer until your partner says "one." 5. Use the ruler to measure the distance between the two pokers. 6. Write the distance on the chart, in the section for "Partner #1" and "Arm". 7. Repeat steps 1-6, this time on the fingertips, the palm, the back, the leg, and the bottom of the big toe. Write down your answer on the chart. Do you notice anything? 8. Now reverse the roles. Let your partner poke, and you close your eyes and try and see whether you feel one thing or two things. In some places on your body, like the fingertips, the distance at which the person first feels only one poke is very small. At other places, like the back, the distance is very big. What does this mean for your brain? Every part of your body is covered in sensory neurons. (If you don't know what I mean by "neuron", read this post.) These neurons carry touch information to your brain. Your brain has a certain amount of area set aside for processing the touch information it gets from each part of your body. In the activity, the distance number for the fingertip was very small. This is because your fingertips are covered with lots and lots of neurons, which makes them more sensitive. More sensitivity means that your fingertips are able to feel small or light things. These neurons go to your brain, which has a huge amount of space set aside for all those neurons. Close your eyes, grab an object, and run your fingers along it. Can you tell what it is? Most of the time, you can. That’s because there’s so many neurons carrying touch information from your fingers to your brain. How about your back? The distance you wrote down for your back was probably very big, maybe the biggest number you got. What do you think this means? The touch neurons in your back aren't nearly as dense as they are in your fingertips. Because there’s fewer neurons, it’s more difficult for you to tell the difference between one poke and two pokes. There's also much less brain space for your back. If you think about it, this makes sense. Do you need to have sensitive fingers? Yes. Does your back need to be sensitive? Does it type? Or write? Do you stick your back into your pack, rummage around, and find your lunch? No! You use your fingers! Your back doesn't need to be super-touch-sensitive. Now think about the other parts of the body that you tested. Was the number big or small? Why? Think about what you use the part for. Does it need to feel things with high sensitivity in order to work? How sensitive do you think the parts of your body that you didn't test are? (Like your cheek or your stomach.) Test them. Were you right? 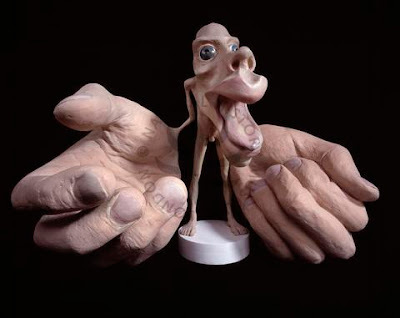 Your sensory homunculus. Imagine putting a knife at the top of the brain, so that is was on a line from one ear to the other, and slicing down. You'd get a slice that looks like the yellow part of the picture. (See the pic of the brain in the corner if you don't understand what I mean. The right side of that pic is the front of the brain). The yellow part is actual brain. 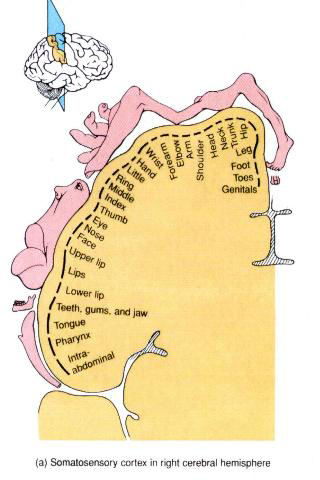 The pink body parts are an adaptation of Penfield's original homunculus drawing. Your brain sees the world in maps. The maps are distorted, depending on how you use each sense, but they’re still maps. Almost every sense has a map. Most senses have multiple maps. You have a "tonotopic" map, which is a map of sound frequency, from high-pitched to low-pitched, which is how your brain processes sound. You have a "retinotopic" map, which is a reproduction of what you're seeing, and it's how the brain processes sight. Your brain loves maps. You even have maps of your muscles. 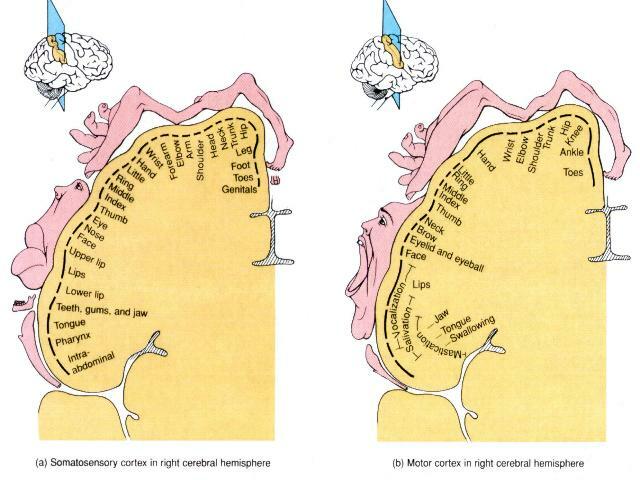 This is a picture of your motor homunculus, which is how your brain “sees” and controls your muscles. It's on the right. Compare it to your sensory homunculus, on the left. Touch is on the left, muscles are on the right. What's different?